Rich, lush tape delay sounds in an incredibly small box. 3 flavors of tape age let you choose how dark and gritty the repeats will get while filter and modulation controls allow for even more fine tuning. Tap tempos with ratio multiplier mean rhythms like dotted eights are all at your fingertips. A digital delay with an analog dry path, the Tape Delay is packed with features, all accessible from the advanced configuration mode. Presets can store all your settings and be recalled at the touch of a button, making switching live fast and easy. Killer Sound Quality – The Signal to Noise ratio is around 103 dB. Tap Tempo with Ratios – Use tap tempo to set the Tape Delays speed; the ratio selection makes fast tempos and triplet based phase times easy. True Bypass and Trails. 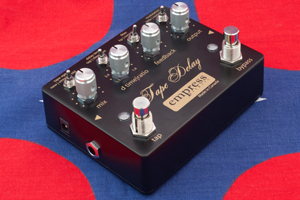 – The Empress Tape Delay Pedal employs true bypass, or you can choose to use buffered bypass with trails. Small Size – The enclosure measures approximately 4.5″ by 3.5″ by 1.5″, which is delightfully small when considering all the features packed into this unit. Analog Dry – The dry signal path is all analog. Advanced Configuration – let you customize the tape delay to suit your needs. Relay Bypass – Using a relay for bypass means quieter switching and, if the pedal loses power, your signal will still pass unharmed. Filter – Hi pass or low pass the delayed signal. Modulation – Add a little or a lot of modulation, or none at all! Power- standard 9V negative tip DC power, but can safely accept up to 18V. It draws about 280mA.